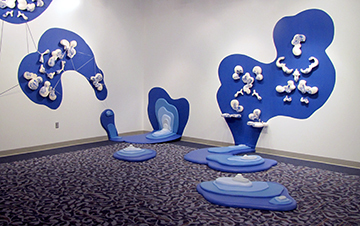 In room-size installations, or “environment systems,” emphasizing the repetitive organic patterns common in nature, Amanda Small creates intricate ceramic and mixed media “maps” implying both a literal and figurative reference to collective history and identity. She explores ways to utilize repetitive, shared patterns as a metaphor for collective experiences. Patterning throughout the space takes on the important role of interfacing between physicality and cosmology and becomes a catalyst to talk about history, collective identity, unity and a sense of place. The resulting systems “maps” explore the relationship between physical place and intangible experience and reflect the ways we make connections through pattern organization and psychological and physical antipodes.